Mon-Fri: 10:00 am – 6:00 pm and by appointment. Good tires can save you money. Quality Tires can increase your vehicles overall performance. Different vehicles have different tire needs, with our wide selection of tire brands you are sure to find the tire that fits your vehicles needs. Being an authorized Hankook tire dealer there are many options we have for your vehicle. TPMS Service – For better fuel efficiency and to prolong tire life. For over 25 years, Jim’s Automotive Repair has been helping drivers across Central Pennsylvania maintain their vehicles. 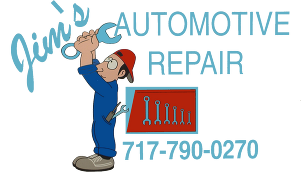 Our ASE-certified mechanics can take care of all of your auto repair and maintenance needs. From oil changes, filter replacements, and fluid flushes to brakes and brake repair, shocks and struts, muffler repair, tires, and wheel alignment, we’ve got you covered.